Because of storm damage to the Veraya nursery and the cancellation of that visit we are now going to see Sue's beautiful bromeliads. A well deserved 2012 Spring Garden Competition winner and just lovely. The quirky embellishments will delight you - just look for the bromeliad chandelier, the award winning water feature, the eclectic collection of bikes to name but a few. This garden is an ever changing canvas for Sue as she finds new and exciting ways to showcase something really special. Sue also has extensive Bromeliad shadehouses that are simply pristine with many, many different broms including neoregelias hybrids, aechmeas hybrids, billbergias plus many more. This Spring Garden Competition winner is a real stunner with beautiful vistas and clever structural additions done by Kellie and her family members. Kellie's huge garden has been established over the last four or so years using some plants that she has bartered/swapped - so most of the species in this garden are proven good performers for this climate. She has used some massive urns as water features - they originally were in her Grandfather's Butchery. A very clever plants-woman, Kellie has created a wonderful garden well worth the visit. 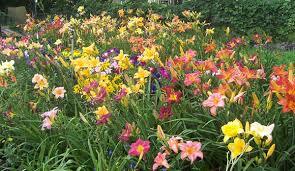 The lower driveway on the right is bordered by daylilies so follow that drive to her garden. Unfortunately this part of the planned outing has had to be cancelled as Neil's garden and nursery has sustained too much storm damage for visitors....... we hope that there is no lasting damage. This garden and nursery will certainly be on our outing agenda in the future. One of the locations for our next outing is a visit to a Vireya Nursery. Neil has been hugely successful in breeding these wonderful plants. He has sent thousands of these plants overseas - notably to the beautiful Gardens by the Bay in Singapore, just think on that when you visit these terrific gardens and feel proud of a very clever Aussie! Named after the French botanist, Julien-Joseph Virey, vireyas were first introduced into Europe in the 1850s but because they did not prove very hardy in gardens, people concentrated on collecting the Himalayan rhododendrons for breeding purposes. It is only recently that these plants have been accepted by the gardening community for their ease of growing as a garden, bush-house or patio plant or even hanging baskets. 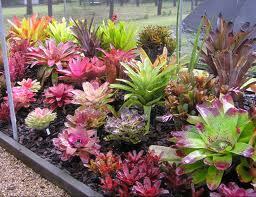 Varieties range widely in size and shape of plant, leaf and flowers. Flower colour varies also, and many are beautifully perfumed. 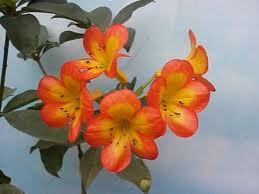 Most Vireyas are spectacularly different from the Rhododendron commonly grown in cooler climates. Many Vireyas are useful as long lasting cut flowers or even for use in corsages. 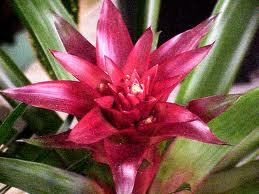 Although Vireyas originate in tropical regions, such as New Guinea, Indonesia and Malaysia, these plants have been grown successfully, for a number of years, all around Australia.